A senior police officer in the National Capital District is the latest arrest by the Policing the Police Task Force Team, clamping down on rouge officers within the force. Chief Sergenat Ben Trepi is the Second Officer in Charge, or the 2IC of the Hohola Police Station, who was arrested and charged for sexual penetration of a female detainee, having in his possession pornographic materials and producing pornographic videos. He was charged alongside First Constable Leo Kambao. The duo were charge over two separate incidences involving an 18-year old female detainee a fortnight ago. News of the tragedy triggered a public backlash on the Constabulary on social media facebook, questioning the safety and security of detainees in police custody. Both Chief Sergenat Trepi and First Constable Kambao are detained at the Boroko Police cells waiting to appear in court. Another police officer who had assaulted his heavily pregnant wife with a 9mm pistol was also arrested and charged by the Policing the Police Task Force Team at the Gordons Police Barracks last Thursday. Evara Kivovia of Ihu, Kikori, Gulf province is attached to the Waigani police station. According to a police media statement, 36 year old First Constable allegedly went home drunk and assaulted his wife. He was arrested and charged for being in possession of an unlicensed firearm, possession of firearm whilst drunk, discharging firearm and assault. 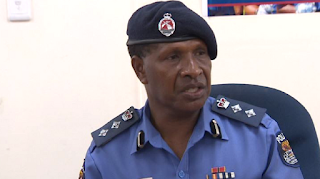 Radio New Zealand reports the NCD Metropolitan Superintendent, Perou N'dranou, saying 15 police officers have been jailed in Port Moresby in the past four months for offences including brutality, aiding prison escapees, and domestic violence. They are among 31 officers who were arrested and charged since September. Mr N'dranou says more arrests are likely this year, and they've already noticed a drop in officers involved in illegal activities.